Templates and online inspiration can make creating your yearbook so much easier…except when they don’t fit the style you’re going for. It might sound like a big problem, but it’s not. You can easily fix any of this with a yearbook style guide. Here are three tips on how to keep yourself honest—and your yearbook style consistent—with the easiest style guide of them all: a style tile. Going into your spreads after they’re laid out and applying your style to each page works–but it’s not the cleanest option. What can save you time would be to apply the style to your templated page layouts before any content is added, and have each page start out styled correctly. When to Use: Before you start creating content and sorting through your photos, you will probably have some templated layouts you’re going to use for your pages. These might be provided by your yearbook company, and can be a boon when it comes to organizing. 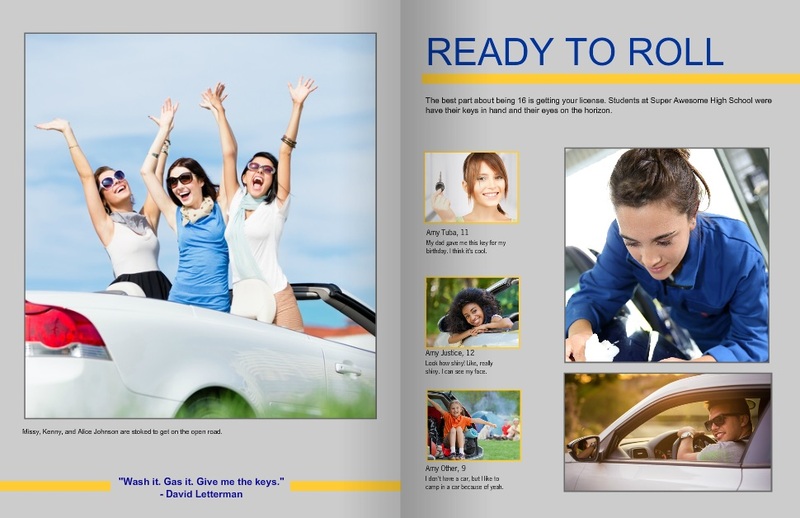 But they can be a bit generic, which is why you want to use the style tile to apply your design elements to each page. How to Use: Your template has space allotted for different elements like photos, an article, and pull quotes. Using your style tile, you can update the fonts and sizes, and figure out where to incorporate additional splashes of color that align with your pre-determined style choices. Why: If you’re applying your style after the fact, it’s easy to miss a color or font or caption somewhere. It’s much better to give a template the style treatment and standardize the style elements before you add content. Also, if you apply your style tile to the template and don’t like the look you’ve created, it’s easy to switch up your style before you’re in too deep. 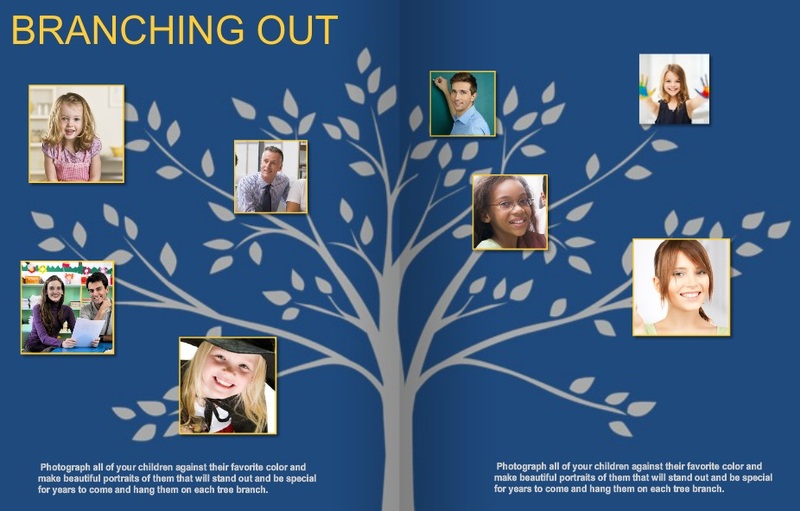 There is great inspiration everywhere, and some of our best yearbook ideas can grow from a spread, picture, or concept we’ve found online or in previous yearbooks. But if you just take an idea verbatim, its style will probably clash with the rest of your book–which is why you need to reach, once again, for that style tile. When to Use: Say you find an amazing spread layout, but it doesn’t conform to your style. Well, it’s time to bust out your style tile and get to work making it fit. Make that inspiration your own, and tie it into the rest of your book. How to Use: In most cases, you will be off to a great start by swapping some colors and updating the fonts. 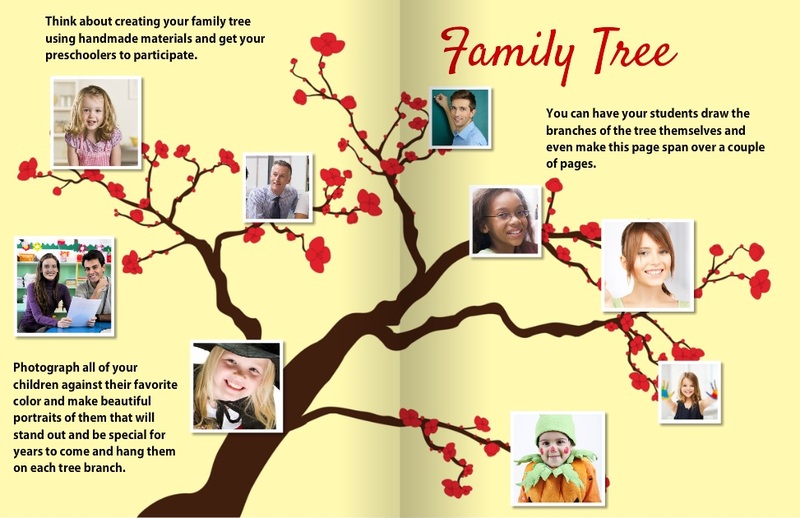 For example, we found a great spin on a “family tree.” In order to make it work with the rest of our book, we switched our font and used a background graphic that matched our colors. 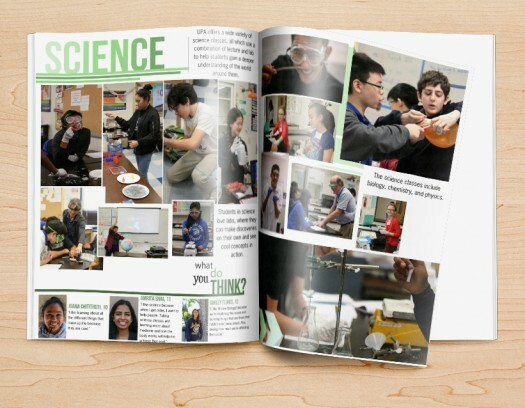 With a few simple tweaks, it looks like it belongs with the rest of our yearbook. Why: There are so many great ideas out there, but it can sometimes feel like fitting a round peg into a square hole. If you keep your style tile within reach while you’re surfing for inspiration, you will have a handy tool to help you visualize how something can work within the style of your yearbook. Before the book goes to print, you’re going to be doing multiple read-throughs, checking everything. Make sure design is one of those things you’re checking, and that consistency exists across all the pages of your book. 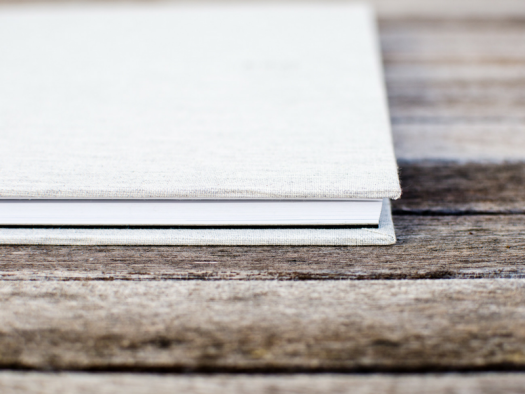 When to Use: You will want to proof the design on each page before your book goes to print. Style tile in hand, make one read-through just for style inconsistencies, just to be safe. 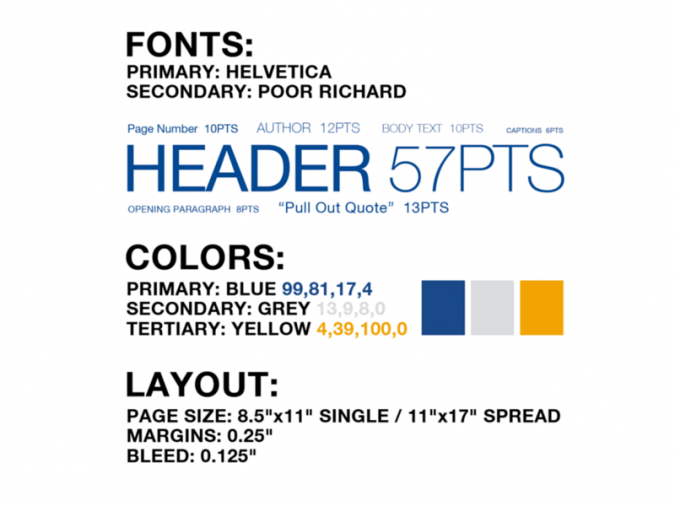 How to Use: Walk through your yearbook page by page with an eye on the style sheet. If something feels out of place, you can easily correct it by altering fonts or adding an additional color from your toolkit. For example, as you assess the spread on the left, you would look at your style tile and determine the incorrect or missing elements. In this case, the size of the pull quote is gigantic and the font of your headline is different. This is easily fixed by correcting the font size, rearranging the content, and consulting your style tile for the correct headline font. Why: There are a ton of things to look for when you are going through your final proof, so you need to take time to do individual run-throughs for each element, or something might get missed. For one read-through, keep your style tile close at hand, and hone in just on it. 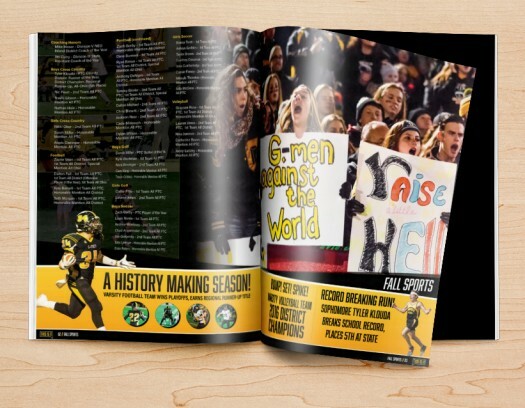 In doing so, you are making sure that the final design is consistent throughout your yearbook. Using a style tile can help you stay consistent when customizing pre-designed templates and designing your own. What’s more, it’ll help you keep your design in check when you’re pulling inspiration from across the board. You’ve deliberately chosen each element of your yearbook’s style, from color to font, and your style tile will help that vision come to life by keeping a strong hold on your original intentions.